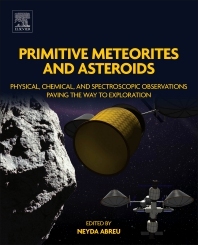 Primitive Meteorites and Asteroids: Physical, Chemical, and Spectroscopic Observations Paving the Way to Exploration covers the physical, chemical and spectroscopic aspects of asteroids, providing important data and research on carbonaceous chondrites and primitive meteorites. This information is crucial to the success of missions to parent bodies, thus contributing to an understanding of the early solar system. The book offers an interdisciplinary perspective relevant to many fields of planetary science, as well as cosmochemistry, planetary astronomy, astrobiology, geology and space engineering. Including contributions from planetary and missions scientists worldwide, the book collects the fundamental knowledge and cutting-edge research on carbonaceous chondrites and their parent bodies into one accessible resource, thus contributing to the future of space exploration. Dr. Abreu is a Planetary Scientist with a background in geochemistry, mineralogy, petrology, physics, and astronomy. Dr. Abreu’s interests are: (1) determining the effects of asteroidal processes that resulted in the mineralogical and petrologic characteristics of chondrites, including brecciation, aqueous alteration, thermal metamorphism, and shock metamorphism; (2) understanding the origin and distribution of volatiles and organics in chondritic meteorites, including hydrated silicates; (3) determining the spatial scale of chemical compositional variations resulting from processes operating on asteroidal regoliths; (4) using chondrites to constrain the composition and structure of asteroidal regoliths and (5) determining what can be learned about asteroidal regoliths from proximity and contact exploration. Dr. Abreu has published and refereed numerous peer-reviewed articles on the characteristics of carbonaceous chondrites. She has served as the principal of a NASA grant and collaborator in several others. She was part of the 2009-2010 Antarctic Search for Meteorites field season, for which she received the NSF Antarctic Service Medal. Dr. Abreu has been part of numerous NASA grant review panels and served in the program committees of national and international conferences.